Today I've got a couple of plants that might be in trouble. As they're new for me this year I'm unsure what is going on, and am asking for some help. 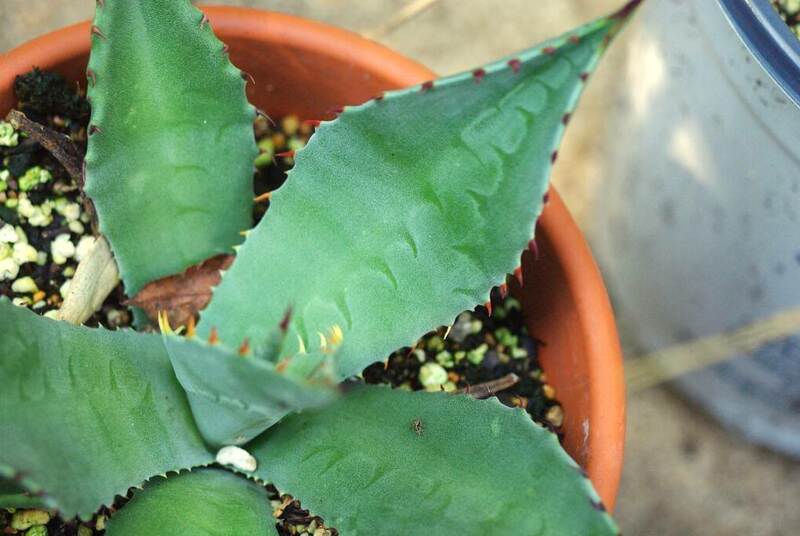 The first is an Agave. 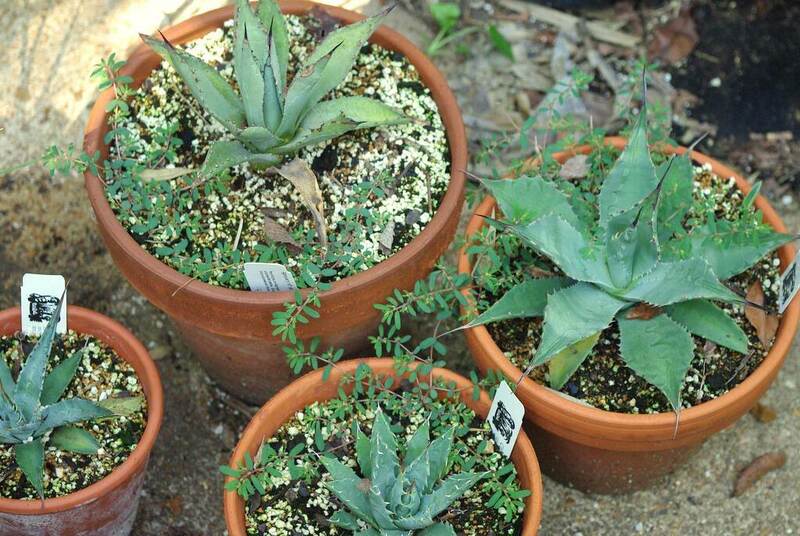 In the spring I bought five or so Agaves from Cistus nursery, potted them all up in clay pots, and let them grow. The one above is an example of a healthy one -- there's nothing wrong with it (other than the spurge growing there). 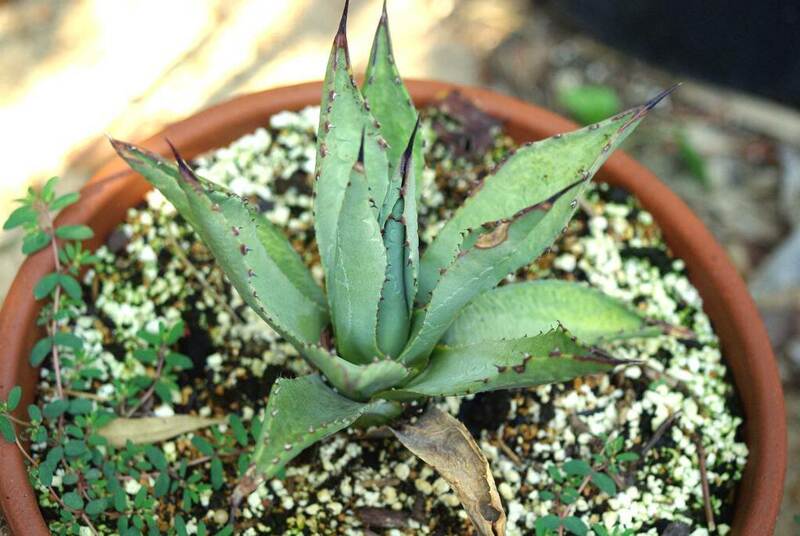 I'm not sure if it comes across in the photos, but it has a bit of a yellowish cast, and it's certainly not full and healthy looking like the other Agaves that were put in the same potting mix and kept side-by-side all summer. So, can anybody tell me what's wrong with this one? When this showed up on the first plant (I have four of these), I thought it was rot. When the rest of the plant looked fine a month later, and when the three other plants started doing the same thing, I started thinking this was normal. So, is this something to be concerned about, or is it normal for this cholla? 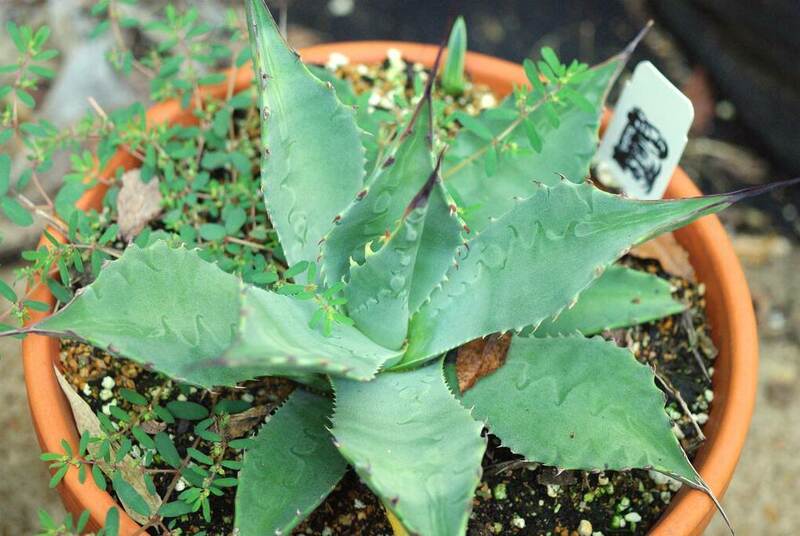 I think the 2nd agave is OK. Certainly not as healthy as the first one but they don't all develop the same way. Maybe move it to a more sheltered spot (morning sun) and unpot it to see if it has healthy (white) roots. 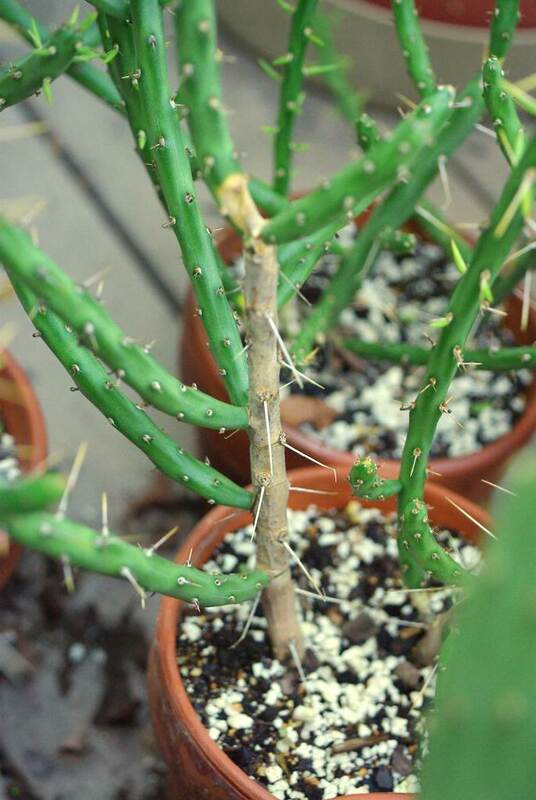 After repotting, don't overwater. I can't help you with the cholla, unfortunately, except to say that I've seen plenty of chollas in the wild that looked half dead but still had healthy new growth. 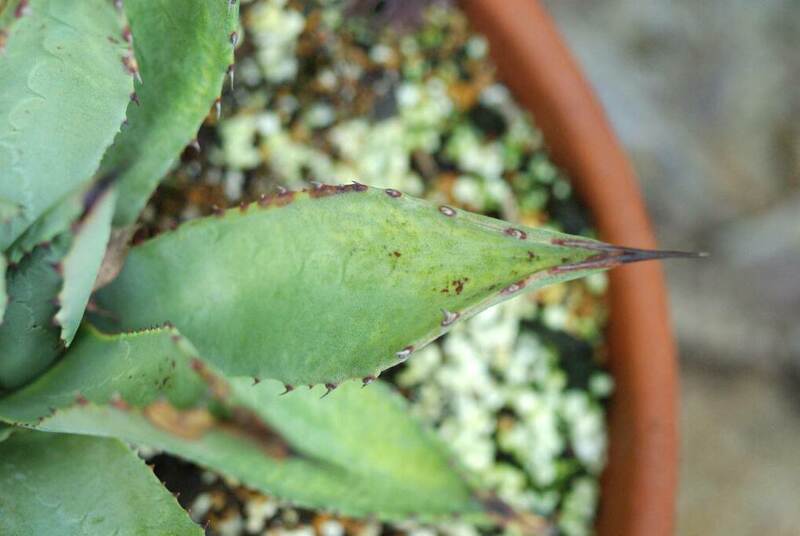 Alan, I think that Agave is probably showing symptoms of a root problem, maybe a moisture issue. Sometimes if the potting mix is peat based, even if it has lots of drainage material the peat can cause rot issues with desert plants. That coloration seems to be normal on the cholla. 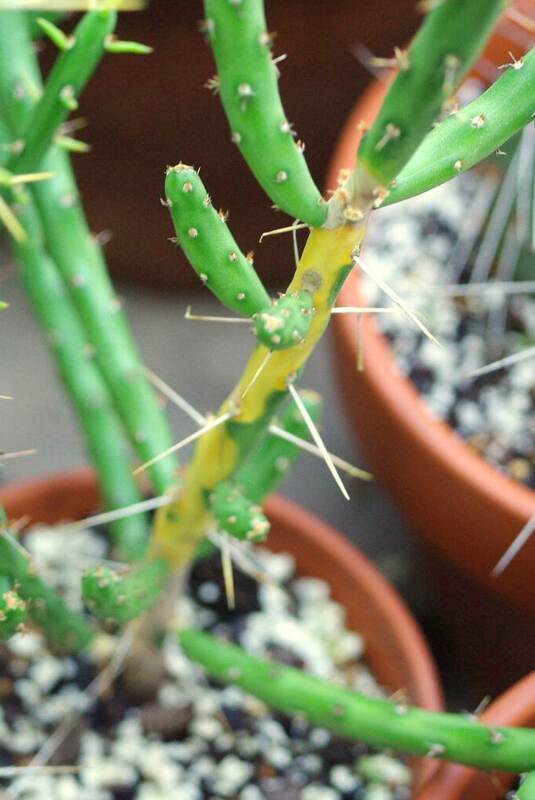 Lots of Opuntias and Cylindropuntias do that, usually only in the lower portions, developing arborescent tissue. I held off on commenting yesterday wanting to come back and see what others had said. I do agree with Gerhard, believing that the "problem" agave is actually fine. I have a couple that have taken on that coloration and find that moving them to a slightly shadier location has helped a lot. Alan, the agave really doesn't look bad. I did notice much more of the pearlite had worked itself up in that pot - I wonder if that left the potting soil less aerated? If so, it could definitely be a moisture issue.